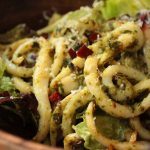 Pesto Calamari with Chorizo & Feta Salad - Headbanger's Kitchen - Keto All The Way! I love a good salad and this pesto calamari with crispy chorizo and a feta dressing makes an incredible Keto salad. This salad absolutely hits the spot as seafood is a nice light meat and you get your essential fats from the feta dressing and the pesto as well. The chorizo will provide a lovely salty crunch to the dish and the lettuce will bring the freshness. You could add in a few chopped cherry tomatoes if you like or perhaps even some fresh basil leaves. Basically, you can tweak this to your liking. While store bought pesto is quite good, it’s quite something else to make your own at home. The best part of the home made pesto is that you can tweak it for maximum fat which makes it the perfect keto fat bomb. I’m personally not a fan of popping fat bombs, I’d rather eat food and keeping that in mind the high fat home made pesto really does the job helping keep the fat % up in your recipes. Anyway enough jibber jabber, get my recipe for home made pesto here. For the Feta Dressing, Get this recipe on myfitnesspal. 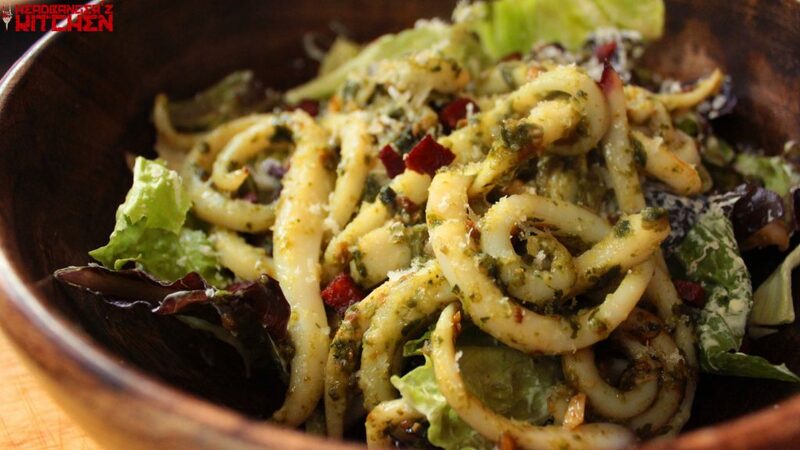 For the Squid/Calamari Salad, Get this recipe on myfitnesspal. Mix all the ingredients in a blender till it emulsifies and forms a rich creamy mayo like texture. Add water to thin or serve/use as is. Heat Olive oil and butter in a pan.